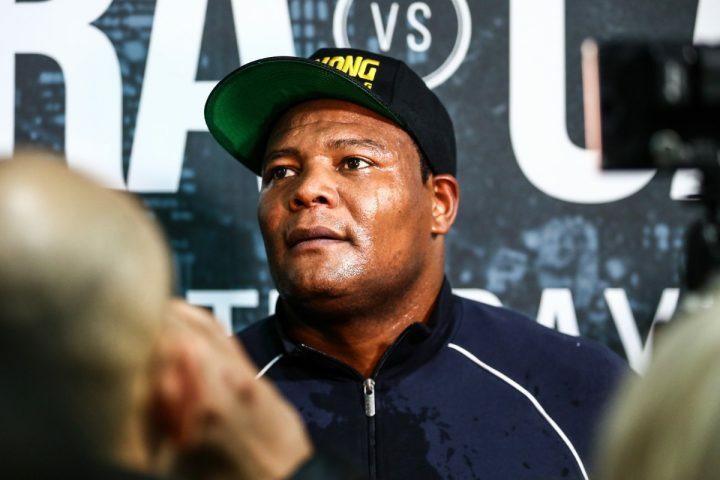 By Jeff Aranow: Eddie Hearn says Anthony Joshua wants former heavyweight world title challenger Luis “King Kong” Ortiz as the replacement opponent for Jarrell “Big Baby” Miller for his June 1 fight. However, Hearn states that he spoke to Ortiz’s team, and they they think he WON’T be ready to take the fight in June. Hearn disagrees with them. Hearn is looking to have a replacement opponent read in case the New York State Athletic Commission fails to license Miller (30-0-1, 23 KOs), whose urine sample tested positive for the banned substance GW1516 for a test from March 20. If Miller can’t get his boxing license, then he won’t be able to face Joshua on June 1 at Madison Square Garden in New York. Ortiz, 40, fought last month in beating Christian Hammer (24-6, 14 KOs) by a 10 round unanimous decision on March 2 at the Barclays Center in Brooklyn, New York. Whatever weight that Ortiz put on in the last month, he should be able to lose in the next seven weeks to fight Joshua on June 1 at Madison Square Garden in New York. If Ortiz can’t take the fight, Hearn said he would select from these fighters: Adam Kownacki, Kubrat Pulev, Michael Hunter, Dillian Whyte, Joseph Parker, and Manuel Charr. Hearn didn’t sound enthusiastic about Joshua defending against Charr, Hunter and Pulev. Hearn likes the idea of matching Joshua against Whyte. However, he doubts that Whyte, 30, will be ready to fight on June 1, as he’s already scheduled to fight on Sky Box office on July 13. Whyte and Hearn are waiting for the World Boxing Council to make their ruling on whether to grant their wish to challenge the winner of the May 18 fight between WBC heavyweight champion Deontay Wilder and Dominic Breazeale. If Whyte faces Joshua instead on June 1, then he can forget about getting a title shot against the Wilder-Breazeale winner. Whyte is unquestionably better off fighting Joshua than taking a risky fight against Wilder, that would likely pay him less. “Right now, the mindset is who’s the replacement,” Hearn said to IFL TV about him looking at all options to try and find a suitable replacement for Joshua to fight on June 1. “People see a massive opportunity. It’s not like we’re two weeks away. We’re just under seven weeks. So if you’re a heavyweight, you have enough time to prep and win a world title,” Hearn said. Given that Hearn is the one that’s doing all the talking, you have to wonder whether what he’s saying is on the level or not about Ortiz’s team saying he might not be ready for the fight. It’s hard to imagine Ortiz’s team turning down a huge payday like this against Joshua. If Hearn doesn’t want Ortiz to be the guy that Joshua faces, he could drag his feet, and twist words in order not to make that fight. Hearn admits that Ortiz is probably a tougher fight for Joshua than Miller would have been. Ortiz is reportedly saying he DOES want the fight with Joshua, so it’s unclear why Hearn is saying that his team don’t think he’s going to be ready in time for June. “I love that fight,” Hearn said about Luis Ortiz being an ideal opponent for Joshua to fight on June 1. “That is an ideal scenario. That is a big fight. I know his team. I spoke to them. My feeling from them is, we [Luis Ortiz] won’t be ready, but I disagree with them. The argument is that’s a better fight and a tougher fight than Jarrell Miller, some might say,” Hearn said. In terms of interest from U.S boxing fans, Ortiz is clearly the best option for Joshua to fight, and the one that he should have been looking at all along. Miller has never faced anyone to make a name for himself in his television fights in the U.S. Miller has been beating lesser fighters like Bogdan Dinu, Tomasz Adamek, Johann Duhaupas	, Mariusz Wach, Fred Kassi, Gerald Washington, Nick Guivas, Donovan Dennis, and Akhror Muralimov. Those are the fighters that the U.S boxing fans have seen Miller beating. Those are lesser guys. Ortiz is the one that has been registering the better wins in beating Christian Hammer, Razvan Cojanu, Travis Kauffman, Davis Allen, Malik Scott, Bryant Jennings, Tony Thompson and Lateef Kayode. Ortiz challenged WBC champion Deontay Wilder last year, and came close to pulling off an upset in the seventh round when he had Wilder badly hurt. “I saw where someone said Manuel Charr is in negotiations [with Joshua]. We’re not,” Hearn said. “He [Charr] sent me a text, saying, ‘I will accept the fight.’ He’s the WBA ‘regular’ champion. He’s not on the list of eight, who are registering to look at and consider. Who is on that list is all the people [one would think of as being the top heavyweights in the division]. Yep,” Hearn said when asked if Adam Knownacki is among the names on the eight-fighter list for the Joshua fight on June 1. Charr would be a horrendous option for Joshua, as he’s not fought in a long time, and not well known in the U.S. It would be a good option for Joshua, because he wouldn’t need to worry about losing. It would be a showcase fight. You can argue that there would be even less interest in this fight than there was for Joshua’s last match against Alexander Povetkin. “If Dillian Whyte wants to fight Joshua in June at MSG, 100 percent [he would be considered], but he ain’t going to be ready for June,” Hearn said. “If he is, then there’s a serious conversation and we’ll talk on that, but he’s training for July ,” Hearn said. Hearn promotes Whyte and Joshua, so he would love that fight. It’s not a good match for the U.S. Both guys are from Britain, and neither well know with the casual boxing fans in the States. “Any heavyweight in the world can step in on June 1. Not one person will be turned down,” Hearn said. “I don’t look at Joe Joyce as a heavyweight world championship level contender yet. I think he’s a really good fighter. He’s not registering in my mind like an Ortiz, Adam Kownacki or even a Charr. A lot of people talk about Michael Hunter. Michael Hunter is actually a tricky fight for AJ. He’s smaller, a good fighter coming off two wins. He has one loss in his career to [Oleksander] Usyk. Charr hasn’t boxed [in over a year]. He hasn’t got much credibility. [Kubrat] Pulev, we like as well, if he wants it. I know he’s got some issues,” Hearn said. Hearn is contradicting himself by saying, “Any heavyweight in the world can step in on June 1,” but then rejecting 2016 Olympic silver medalist Joe Joyce as an option for Joshua. Joyce recently knocked out former WBC heavyweight champion Bermane Stiverne in the sixth round last February. Joyce looks like a much better fighter than Charr right now, who Hearn rates as being above him. “There’s eight recognizable guys. It’s which one,” Hearn said in talking about the potential eight-man list of heavyweights he’s considering for the replacement opponent for Joshua on June 1. “[Joseph] Parker came on and said, ‘We’ll go again.’ I don’t think that’s an option. A lot of them [can make the same money as Jarrell Miller]. That pot of money is there for a big name fighter. Last night about 16 fighters came on for that fight. 10 of them ain’t going to make the grade or maybe eight of them of them will even be considered,” Hearn said. Using Joseph Parker as the replacement opponent for Miller wouldn’t go over well in the U.S. Joshua beat Parker by a 12 round unanimous decision last year in March 2018 in Cardiff, Wales. It’s too soon for him to stick Parker back in the ring with Joshua. Parker is from New Zealand. It’s a poor option for Joshua. The fight likely wouldn’t sell tickets at Madison Square Garden in New York. “Any fighter that says, ‘Seven weights isn’t enough time to fight for a world heavyweight title,’ is a cope out,” Hearn said. “In an ideal world, we’ll fight an American. There ain’t many. There’s one. No [I can’t tell you who the leading candidate is]. Yes [Luis Ortiz would be the guy Hearn would pick if it were up to him]. That’s the first name he [Joshua] gave me last night,” Hearn said about Luis Ortiz.